The world-famous inventor, Thomas Alva Edison, was born on February 11, 1847. He developed numerous devices that had a huge impact on the quality of life all over the world. His inventions include a long lasting light bulb, phonograph recorder and player, and motion picture camera. Edison was one of the first inventors to combine the concept of mass production and teamwork, and apply it to the invention process. Edison is ranked fourth as the most prolific inventor in history. He obtained 1,093 US patents in his own name, in addition to many patents in Germany, France and the UK. Many of his inventions led to further developments in mass communication, especially in telecommunications. These included a mechanical vote recorder, recorded music, electrical power, a battery for an electric car and motion pictures. 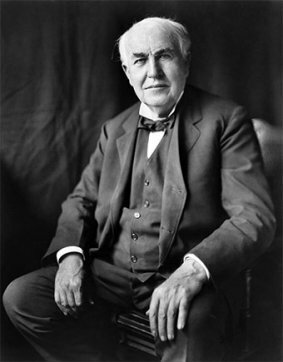 Thomas Alva Edison worked around the railroad, selling papers and candy to the travellers and workers. One day the three-year old son of the station agent got in the way of an oncoming train. Edison saved the boy’s life, which led the grateful father to offer to train him in telegraphy, one of the most prestigious and in-demand jobs of the day. By age 19, he had moved up to a position with Western Union in Louisville, Kentucky. Here he worked the news wire for the Associated Press. This position gave him enough free time, and enough money to work on his experiments. His experimenting eventually got him fired. One night in 1867, the lead–acid battery he was working on spilled sulphuric acid, which ran between the floorboards and landed on his boss’s desk directly below. Although he had been researching and experimenting most of his life, Thomas Alva Edison didn’t officially begin his career until he invented the automatic repeater and made improvements to other telegraphic devices. However, it wasn’t until he invented the phonograph in 1877 that he first got noticed. This creation was so amazing and unique, the general population considered it almost magical. The first phonograph Edison built recorded sound on tinfoil wrapped around a grooved cylinder. The recordings had very poor sound quality and could only be played a few times. A new design using cardboard cylinders coated with wax was produced in the 1880s by Alexander Graham Bell and his team. Not wanting to be outdone, Edison continued to develop his design to create the “Perfected Phonograph”. With the funds Edison received from selling his quadruplex telegraph to Western Union, he built the first industrial research laboratory. He chose Menlo Park, New Jersey, for the location. Originally thinking he might be able to get 4-5 thousand dollars for the machine, he was pleasantly surprised when Western Union offered him $10,000. This made the quadruplex telegraph his first real financial success, and his new laboratory became the first institution built solely for the purpose of improving existing technology and producing new technological innovations. Most of the inventions produced at Menlo Park were legally attributed to Edison, even though much of the research and development was carried out by employees, under his direction. William Joseph Hammer began working at Menlo Park as a laboratory assistant near the end of 1879. Hammer was involved in experiments on improving the phonograph, electric lighting, the telephone, and other inventions still in the development stage. However, his primary work involved the incandescent electric lamp, which led to his appointment at Edison Lamp Works as chief engineer. The company produced 50,000 lamps in Hammer’s first year. The majority of Edison’s patents were 17-year utility patents, and included processes or inventions related to electricity, mechanics, or chemistry. He also had about a dozen design patents, which protected ornamental designs for up to 14 years. As with most patents, Edison’s inventions were mostly improvements over previously created art. However, the phonograph patent was unprecedented as it described the first device to record and replay sounds. Thomas Alva Edison did not actually invent the first light bulb. What he invented was the first practical incandescent light that could be used commercially. Inventors before him had devised incandescent lamps, but there were many problems with these such as a very low life, very expensive to produce, and huge draws on the electric current. This made it infeasible to use them on a large commercial scale. In 1878, Edison described the glowing wire in the light bulb as the filament, although he was not the first inventor to use this term. Joseph Swan, an English inventor had used the term before. Swan was developing an incandescent light that used a long lasting filament around the same time as Edison. Swan’s previous attempts didn’t have the high resistance they needed to be effective. Edison and his team were determined to create bulbs that would last longer. Meanwhile, Joseph Swan obtained a British patent on his incandescent lamp. Even though Edison’s company had successfully been making bulbs for quite some time, his application for a patent failed because it wasn’t prepared properly. Swan acknowledged he would not have been able to develop the bulb without seeing Edison’s system. Subsequently, Edison and Swan entered into a joint venture known as Ediswan. Barely a year later, Edison developed a new concept using a high resistance lamp enclosed in a vacuum, and capable of burning for hundreds of hours. Edison’s goal had always been to develop a commercial application he would be able to mass-produce and sell to homes and businesses. He concentrated his efforts on making light bulbs that would last for a long time, and on creating a system that could generate and distribute electricity on a large scale so people would be able to use these light bulbs. Around 1877–78, Thomas Alva Edison invented and developed the carbon microphone. Along with the Bell receiver, this microphone was used in all telephones up until the 1980s. In 1892, after a prolonged court battle, a federal court ruling finally declared that Edison, not Emile Berliner, invented the carbon microphone. This microphone design was also widely used in broadcasting through the 1920s. Edison never slowed down in his work until his health began to fail towards the end of the 1920s. He obtained his 1,093rd, and last patent, at the age of 83. Thomas Alva Edison died in New Jersey at the age of 84 at 9pm on October 18th, 1931. Discover more Electrician Jobs and Information!